We have performed extensive work in all the South African refineries and have recently become involved in studies, projects and visits to several refineries in the rest of Sub-Saharan Africa. Although we have not visited every refinery in the region, there are many common features in those we have seen which have interesting consequences. 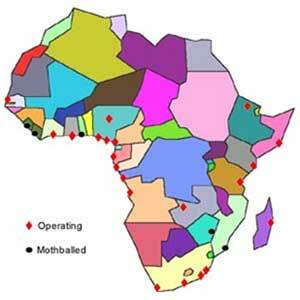 There are 18 operating and 5 mothballed refineries in the Sub-Saharan region, excluding South Africa. The potential capacity is about 860,000 BPSD for the operating refineries, of which 445,000 is in Nigeria and 65,000 for the mothballed refineries. By comparison, South African refinery capacity is about 500,000 BPSD plus an equivalent of 200,000 BPSD from synthetic fuel plants. The refineries are mostly small simple topping refineries but there are a few larger or more complex plants. Although the refineries are all different and operate in different environments, they do face similar challenges. The refineries need to become profitable while selling products at a price related to the cost of importing finished products. The main focus affecting the refineries ability to meet this goal, are related to management, markets, logistics and efficiency. In addition changing product specifications and environmental issues will become a concern in the near future. Most of the refineries are part owned by their respective governments and there is little or no incentive to be competitive. The product price is set such that the refinery makes a profit and the operator receives a fee. This price is normally significantly higher than the import parity price. This price differential has led some organisations to suggest that the smaller refineries should shut down since it appears that they cannot compete with global suppliers even though they are favourably located. The operator normally receives its fee regardless of how well the refinery is performing. Refinery performance will improve if the management structure is changed to reward effective operation and penalize poor performance. Some countries are investigating privatizing their refineries which will lead to more effective operation. Most African countries have regulated markets and most of the refinery products are sold locally. Products which cannot be used locally are exported, sometimes at very low prices. For some of the inland refineries only products for which there is a demand can be produced because of the difficulty and cost of transport. Some refineries run at significantly less than their potential capacity because of the problems associated with getting the product to a potential market. Residue in particular is often a problem because it is usually exported at a loss if it can be exported at all. Most of the refineries do not have any residue upgrading facilities and for them the only way to optimize residue production is by careful crude selection. Predicting future market demand is extremely difficult because of the significant political and economic uncertainty in many African regions. This uncertainty makes long term planning difficult and potential upgrades or debottlenecking projects are hard to justify. Currently growth in Diesel, Jet Fuel and Petrol is being predicted for most of the region. A total hydrocarbon fuel increase of about 3% is predicted. Because many refineries in the region are operating below capacity or have not been upgraded since their start-up, there is an opportunity due to changes in catalysts and design technology for relatively cheap revamps to take up die demand. Most African refineries are located remote from the source of crude, international markets and suppliers of engineering and equipment. Cost effective procurement of the required crude is complicated by the need for small shipments which must be transported long distances. The high cost of shipping affects the refinery profitability and the shipping time affects operating flexibility. Maintenance and refinery upgrading is imported by the fact that the engineering and construction ability in many African countries is limited. In addition almost all of the material and equipment needs to be imported. Refinery efficiency is made up of the actual operating efficiency while the unit is on-line and the percentage of time that the unit is operating. Most of the existing refineries have low energy efficiency and high losses because they have not been upgraded or optimized and have not kept up with new development and trends. The refinery designs are outdated and there is little integration between units. Personnel and operating costs are also high compared to capacity. The refineries are also often operated to meet the requirements of the original design even though the real situation has changed. Also the original crude slate is used even though product demand has changed. Typical losses and costs compared to world norms are shown in Table 1 below. A small move towards world norms could lead to large improvements in profitability. Potential solutions include revamps which address energy efficiency and heat integration, improved process control, taking advantage of technology and catalyst improvement, better operator training and improved maintenance practices. A re-evaluation of refinery economics would also help. Bad planning often leads to refinery shutdowns due to product storage being full or crude feed being unavailable. Unplanned maintenance also has a significant impact on downtime and is costly. Typical costs and availability compared to world norms shown in Table 2 below. *EDC is Equivalent Distillation Capacity taking refinery complexity into account. Improved maintenance practices and production planning can lead to a significant improvement. Specifications for sulphur in diesel and lead in petrol are currently under review. Typical targets are 0.5% sulphur in diesel and 0.15 Pb/l in petrol. Currently many refineries are running at 1 to 2% sulphur in diesel and 0.7 g Pb/l in petrol. As the requirements become more stringent many refineries will have to upgrade to meet the new requirements. Currently there is little pressure on Sub-Saharan African refineries to reduce their impact on the environment. However trends show that in future attention will have to be paid to the quality and quantity of gaseous and liquid effluents as is currently happening in the upstream industry. Many of the African refineries have been subject to years of operation with little regard to refinery economics and no development. These refineries are characterized by high losses, low efficiency and poor availability. As a result there is a perception that these refineries cannot be made to operate economically, The challenge is to improve and upgrade the refineries so that they do operate properly and become commercially viable. Modern design, operating and maintenance practices offer the opportunity to improve profitability. In addition, some of the South African refineries have already been significantly debottlenecked and increasing their capacity, it can only be achieved at a relatively high cost. Future increase in demand for the region could potentially be achieved by debottlenecking the currently under-utilised refineries in Sub-Saharan Africa. AVEC's commitment to supporting our client's business objectives means that we always try to respond appropriately to requests for our services or assistance. We are not encumbered by the mindset of 'doing what we have always done, because that seemed to work in the past'. We are committed to quality. All our work is performed to the high standards of auditability and accountability required. We offer a range of services from feasibility studies, through the various engineering phases, to construction and commissioning support. In addition, we can provide consulting services such as plant or project audits, troubleshooting, value engineering facilitation and participation. We have many contract types from lump sum professional services through to cost-plus reimbursable projects. We believe in risk and reward contracting with incentives and would be pleased to discuss bonus/penalty scenarios on any potential contracts.